From left to right: Glenn Andrews, Ayden Ilutsik, Lloyd Active, Memphis Gosuk and Jaren Tinker. On an icy Monday in January, the Aleknagik Lakers warmed up on the basketball court. It was the day after a tournament in Togiak. As the kids ran drills, they were all a little sore. 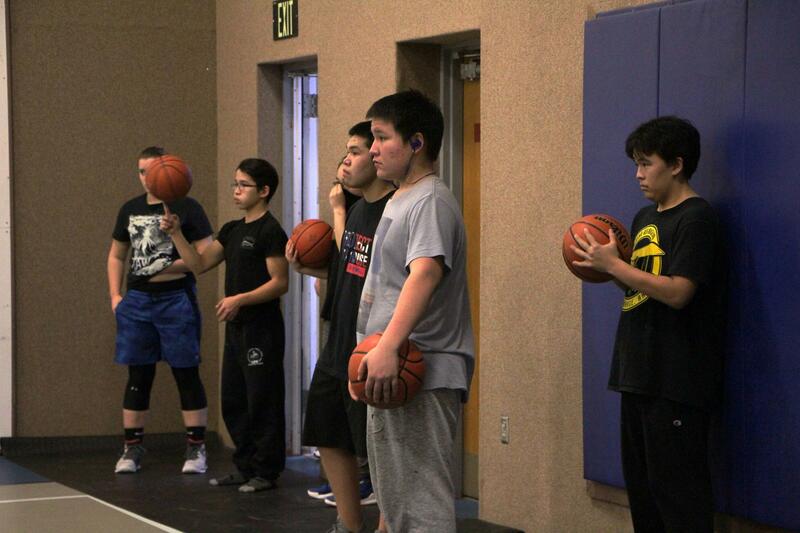 Allen Ilutsik has been coaching the Aleknagik middle school basketball team since 2015. Now he’s coaching Aleknagik’s first high school boys’ team in 32 years. Aleknagik is a tiny community of just over 200 residents, and for decades it didn’t have enough students for a high school. It finally reopened in 2016. This is the first year that there are enough students for a boys’ basketball team. “The majority of the high school aged kids have gone in to Dillingham for school, or to Mount Edgcumbe. And when we were able to have the high school here, we finally got four high school boys and one eighth grader,” Ilutsik explained. Basketball is important in Aleknagik; many of the boys have been playing since they were small. Having a team gives them a structure to learn and improve as athletes. It’s also a reason for them to stay on top of their schoolwork. Glenn Andrews is in 10th grade, and he plays forward. Lloyd Active during the Aleknagik boys' first game in the Sockeye Classic Tournament against Sand Point. "Yeah, I played when I was in middle school, but not last year. This is my first year of playing high school basketball. It’s been fun. It’s been fun learning," Andrews said. He also hopes to play next year. "We will have enough for next year, so just have to get our grades good. You have to have a C or higher to play the week before, and you have to pass the semester." Lloyd Active is in 11th grade, and school is a motivation for him as well. “Never played basketball for three years. Last time I played was in eighth grade,” he said. "It's fun, not being stuck in school." With only five players, they get a lot of individual playing time. During a game, there are no substitutions and no breaks. Allen’s son, Aydan, is the one of the co-captains. Being a team leader also comes with certain responsibilities. Jaren Tinker is the other co-captain. His dad played on the 1987 team. “In the beginning of the game they tell you we represent our community and team,” he said. Memphis Gosuk started playing basketball at Dillingham middle school. Now he’s in 11th grade at Aleknagik, and he said that he likes being a Laker. “Playing up here is playing with people you know, and how they play. It’s fun. Better. Sometimes you know what the person is going to do during the play, like just on motion offense you know what they’re going to do,” he said. This isn’t the first time that student athletes have broken ground since Aleknagik’s high school reopened. The girls paved the way when they started the school’s first ever girls’ basketball team two years ago. This is their third season. Logan Ball is a senior, and she says that being on a small team has pushed them to be better players. 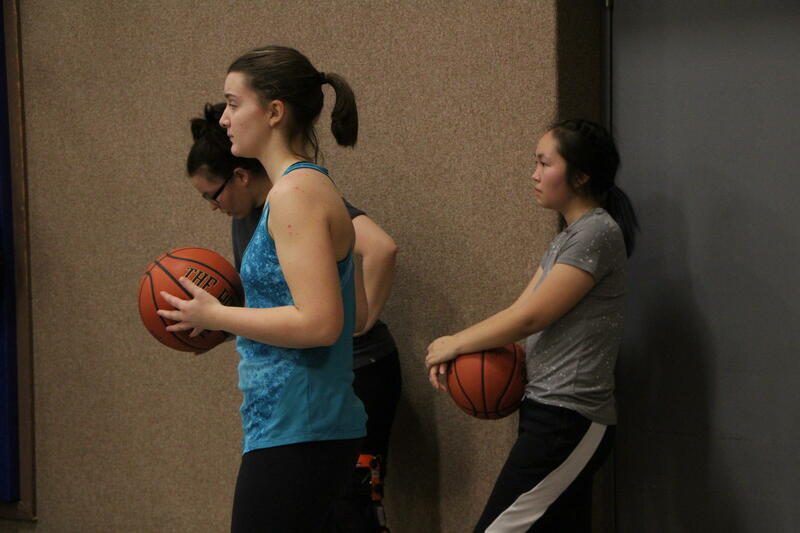 Aleknagik started its first ever girls' basketball team two years ago. They are now in their third season. Both teams travelled to Dillingham for the Sockeye Classic Tournament this weekend. The boy’s first tournament was on the home court two weeks ago, and they won all three games. “We were all hyped up for our first basketball game in 32 years,” Ayden Ilutsik said. As Monday’s practice wraped up and the kids headed home, Ilutsik said that being part of a team and having the chance to play competitively can help the kids learn how to deal with a lot of other challenges. Their next home tournament is Feb. 15.